Are you looking for custom interior or exterior signage displaying your logo? Do you need employee recognition or donor thank you plaques? Maybe you want wine boxes, glasses, or tasting trays for your restaurant. I have a solution for you! Contact Me with your vision! 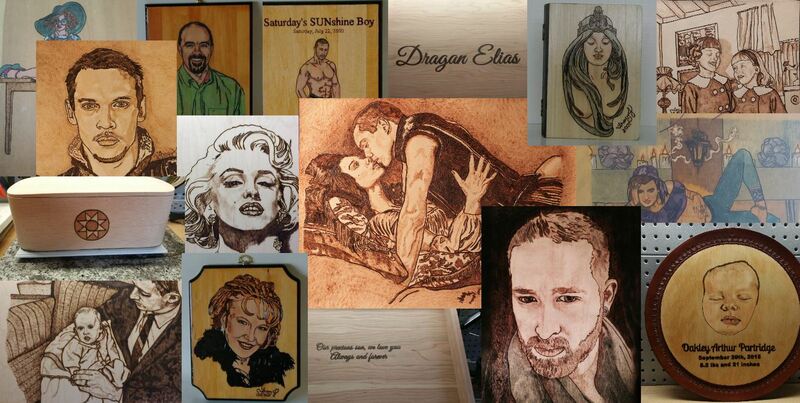 If you are looking for a truly one-of-a-kind gift or memorial portrait, I have more than 20 years as an experienced and professional pyrography artist. I would love to help you create something special that will be cherished for years to come. Contact Me to explore possibilities! 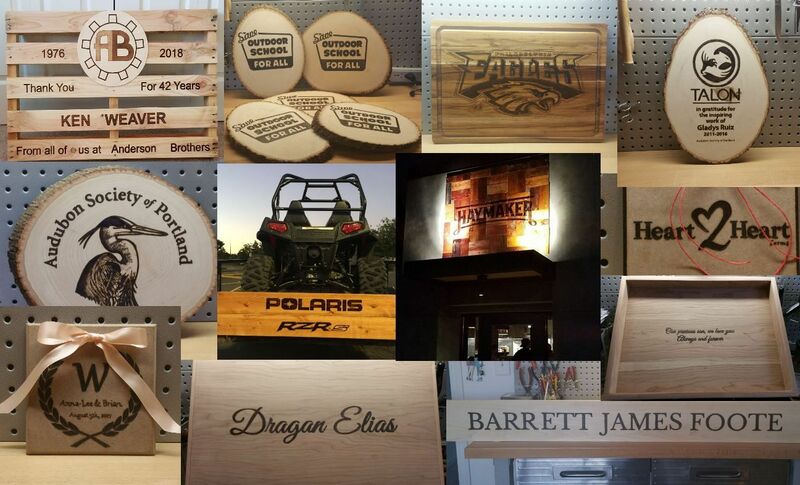 If you're looking for precision and/or multiples of a specific design then my new Laser Engraving service at Hearth and Forge might be just the ticket! I Now Offer Individual and Group Pyrography Classes! Mouse over PRICING in the top menu for details! I ALSO BURN ART AND LETTERING ONTO A VARIETY OF OTHER WOOD AND LEATHER SURFACES...cutting boards...spoons...gun stocks...rolling pins...wild-edge tree slabs...trailer and truck tail gates...jewelry. If it's unfinished wood or vegetable-tanned leather I can burn art or lettering onto it! CONTACT ME with your dream or vision! NEW SERVICE! I now also offer custom LASER ENGRAVING for more cost-effective pricing on multiples orders. So, if you need several or many of the same or similar items I can now provide a very nice quality laser-engraved version that looks BEAUTIFUL but at a fraction of the cost that hand-burned pyrography would cost! BONUS! I can laser-engrave on a MUCH WIDER VARIETY of materials than I can with hand-burned pyrography! etc... Visit my sister site, Hearth and Forge, for more information. Can you guess which character is NEXT in my series??? I’ve been having a yearning to play with some fun burning…just for myself! And since I’m a HUGE Harry Potter fan I decided to do a portrait of him. This shows the first two phases…and I’ll post a separate one when I feel like he’s fully finished! But for now…this gives a little insight into what I’ve been working on in my spare moments lately! I was recently contacted by a gentleman from Wilsonville, OR who wanted a hand-burned, rustic plaque as a gift for his dear friend to hang on the wall in his mountain cabin. He wasn’t sure what font he wanted or whether to include any graphics or not, but he definitely knew he wanted his friend’s last name and the latitude and longitude coordinates for the cabin. With that information and knowing he was going for a rustic, mountain-cabin feel, I suggested he might like a plaque with an unfinished bark edge in his choice of shape (rectangle, oval). He loved that idea and decided to go with the oval shape. Upon further discussion we decided it might be nice to add a pine tree or two for graphical interest. So, I did some searching and offered him a selection of different tree styles. He preferred the one portrayed on the finished plaque and thought it might look nice to have one on either side of his text. This is a typical example of the process I go through with each individual client. That’s something I really LOVE about hand-burning pyrography pieces. Each one is custom made and a compilation of the client’s initial vision my own artistic abilities. The outcome is always a JOY for me! Walking through each step of the process…making sure the client is pleased all along the way. This plaque may seem kind of simple…but it was crafted with great care and attention to detail. It is a one-of-a-kind gift and I’m excited to hear how my client’s friend reacts when he receives it this coming Christmas! Wood burning started as just a hobby for me. A way to pass the time. The year was 1999 and we had just relocated from our own 20 acres on Central Oregon’s High Desert, where we had been living an off-grid lifestyle for about 6-months. We relocated to a 160-acre abandoned ranch known to locals as “the compound”. It consisted of a small, white, ranch-style house with several other outbuildings and a 2-story red barn. All of that was centered in the middle of what used to be a working alfalfa farm. Stories of our experiences during that time could fill a book…but that’s not my intention with this post. 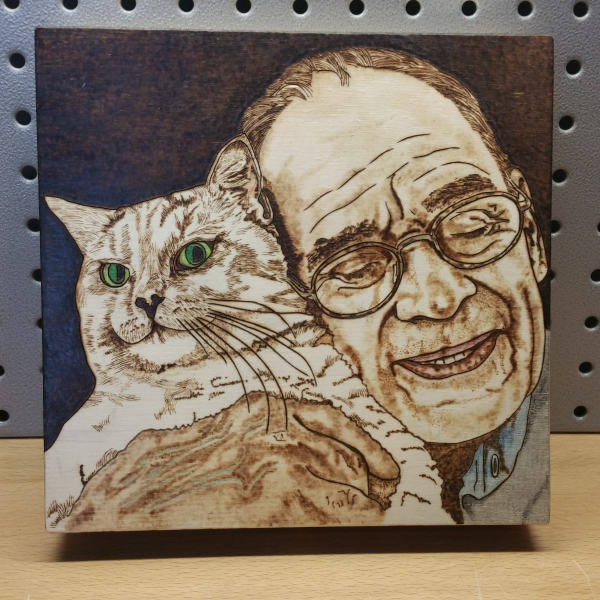 This story is about how I started my adventure into wood burning, or as the art-form is known professionally, pyrography. At “the compound” we had no land-line phone and there were no cell phone towers in that area at the time. So, we had no phone service out there, much less internet access. It was a 35-mile drive into the closest small town to gain access to those luxuries. Needless to say, we had LOTS of time on our hands for exploring our creativity! Resources were limited out there so I had to use what was available to me. I noticed there were tons of loose pine boards strewn around the property…both inside the big red barn and laying around in the yard area. I remembered having purchased a cheap wood burning tool from a craft store before moving away from Portland that was stashed away in a box somewhere. I dug through my things, found it, and decided to play around a bit! Before this time I had only tested out burning a handful of crude shapes and patterns on very small wooden plaques I bought with it when I got it at the craft store. I hadn’t ever made any kind of real attempt at creating a piece of true art or developing any kind of real skill with the tool. So, this time was different. For some reason I felt inspired to see what I could create. I don’t remember when I acquired the packet of carbon transfer paper that I used for my pyrography projects for years…I think I ordered it from Amazon…but I’m not sure if I already had it on-hand from the office supplies I brought with me for doing administrative work for Jeff’s software business or if I purchased it specifically for doing this art transfer…but we had reams and reams of printer paper because of his business so between all the wood scraps laying around the property, the printer paper, and the carbon paper I had loads of supplies to keep me busily creating art as my heart desired! If I remember correctly, I already had lots of photos saved on my computer from before our move, so I just found some that inspired me and got to work! I set up a small studio space inside the house where I could burn. I’d pop a cd into my “boom box” (do you even know what that is? LOL! ), crank the volume up, and happily burn for hours on end! Interestingly, my very first commissioned piece was for a husband who wanted a special, “intimate” gift for his wife on her 45th birthday. Which I was fine creating for him. (See A Husband’s Gift above). This was followed by a request from a Canadian dad whose son was featured in a local newspaper (See Saturday’s Sunshine Boy above) – this was my very first attempt at hand lettering. So, my career as a professional pyrographer was off to a start…pretty much right from the beginning! Though I didn’t focus on it as a real career option until several years later. 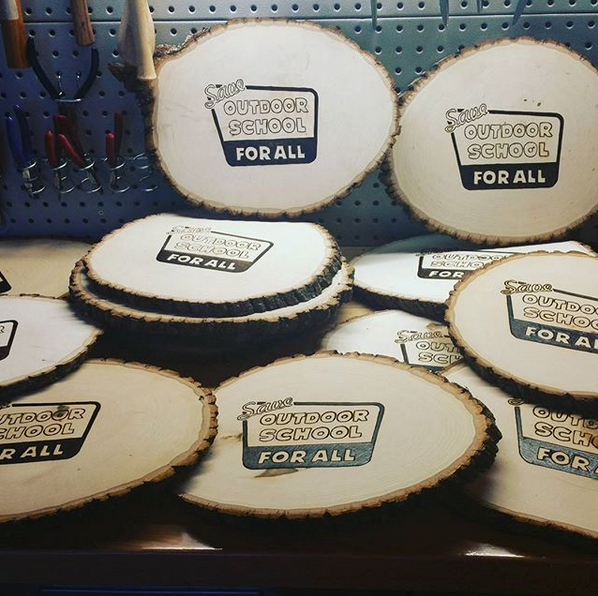 Nick at Haymaker bar and grill is opening a brand new restaurant on Portland’s east side and contacted me to make a rustic exterior sign to welcome his patrons. Nick and his team crafted the sign from old, unfinished barn wood to give it that signature rustic look and feel. After the initial deposit and art placement approval I got to work! The sign was too big to work on in my studio so I had to improvise, working instead on the island in my kitchen. Transfer of the art and initial outline burning took several hours. Now to hand-burn all that empty space in! After sixteen+ hours of work and a couple of coats of clear, protective urethane finish the sign was complete and ready for Nick to pick up and install above the exterior entrance to his new bar. 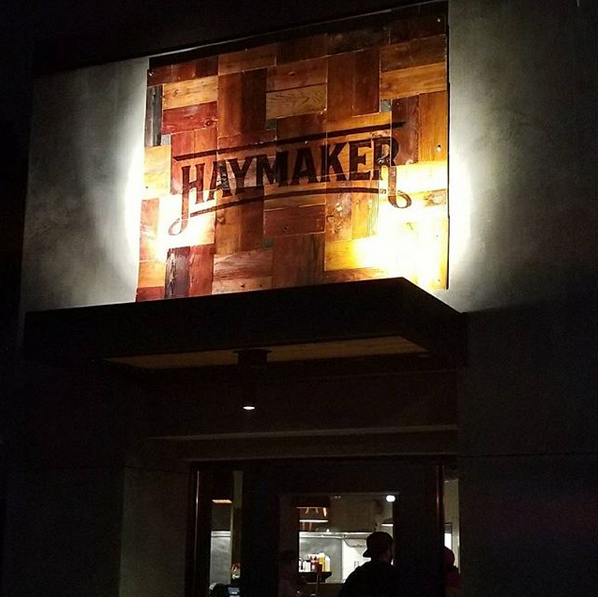 If you’re in the Greater Portland Metro area stop by Haymaker for a drink and a delicious meal from Nick’s eclectic menu…and be sure to tell him I sent you! TO CREATE A UNIQUE SIGN FOR YOUR BUSINESS! I was contacted a few days ago by a local Portland dad who was looking for a pyrographer who could burn the first names and year of his son and daughter-in-law-to-be’s wedding with a little leaf-work around the edges onto a large (36.5″L x 17.5W x 2″H), natural-edge cedar plank they had purchased. And what are the groom and bride-to-be going to do with this plank? They plan to use it as a Guest Book, of sorts, for their wedding attendees to sign in Sharpie! Isn’t that an AWESOME idea? I’d never heard of anyone doing something like this before! They then want to hang the piece on a wall or place it on a mantel as decor/art in their new home. Of course, I told Kevin (the dad) I’d be more than happy to do this work for them! He emailed me the original artwork created by the couple themselves and I worked out an initial estimate based on the approximate length of time I figured it would take me to complete the piece. Yesterday Kevin and his wife, Teresa, stopped over with the wood and we had a great visit! We talked about placement, size, and I also asked him about how he wanted the piece finished. He mentioned he was planning to seal the surface with lacquer and I advised him that he might want to wait to do that until AFTER all of the signatures are on the piece in order to insure the signatures adhere properly and permanently to the wood. Also, I mentioned I recommend using a spray-on lacquer rather than a brush-on type because…even though it’s permanent marking pen…you just never know for sure how the sealant might interact with the ink and they wouldn’t want to risk any smearing when applying with a brush. 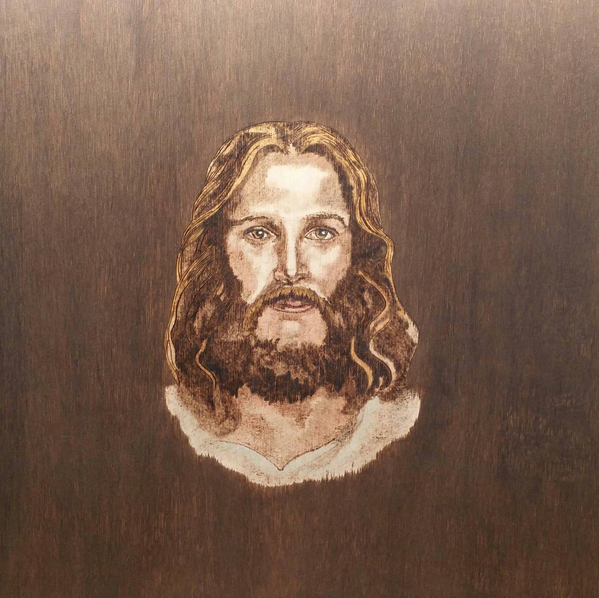 I spent some time resizing the artwork and placing it on the wood this morning, followed by these photos I sent over to him for approval before I move forward with the actual art transfer to the surface of the wood. I’ll post more photos of the finished piece when it’s completed. I’m super excited about this piece and especially about the concept! I think it’s a great idea for this use, as well as potentially creating address markers with family name and address to prop against the front of a house or attach to a post in the front yard, etc. Lots of great possibilities here! And the cedar smells GREAT…so it’s a real pleasure to work with! I may be working on a client project. Please leave a message and I will return your call asap. Copyright ©2019 Portland Pyrography. All rights reserved.